Full Service Yarn Shop: Hello, my ankles, how I’ve missed you. When I cut back or eliminate ice cream, I like fat free lemon (sub chocolate or your favorite fruit flavor) sorbet or italian ice. Even a frozen Capri Sun (cut off the top and eat like a push up pop) will do. It's hard to give up frozen treats when it is as hot as it is this summer!! (And somehow, moving from the muggy NY Hudson Valley to Colorado's Front Range has drastically reduced the number of puffy days for my 46!! yo overweight ankles). Thanks for the suggestions! You gotta love the frozen dessert in summer. I've been making smoothies with frozen fruit that have been really hitting the spot. [sniffle] Do you have any idea what in the ice cream is causing you problems? Cream? Because then you could sort of work around it. Of course, I just tried to buy a baby foot-cream gift for a friend who turns out to be allergic not only to artificial perfumes but to natural stuff like lavender oil... so I know sometimes there really is no way around things that irritate your system. Be strong, Lucy! 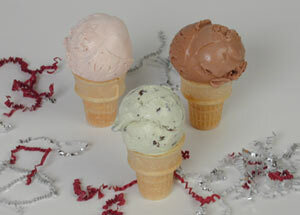 It has to be hard to give up ice cream but feeling better will make it worthwhile. I'm fairly sure it has something to do with the milk fat and the sugar. I think I'm better off going cold turkey. Once I got through the first few days, I don't seem to be craving it any more. Thanks for all the advice and support everyone!